#WOIC2015 is now a memory as everyone has left Silicon Valley and back home. Now that I've had a chance to get home (and pack up and leave again), let me offer a few thoughts on the 2nd World Open Innovation Conference -- not as program chair, but as the owner of OIBlog.net who blogs about open innovation related conferences. Here are a few thoughts from Friday’s session. I often find the final day of a conference a let down -- either because of the content or because I'm just plain worn out. Meanwhile, at good conferences, there's a twinge of disappointment at having to end what has been a great opportunity to hear and meet with like-minded scholars. On Friday, I definitely had more of the latter than the former, despite continuing to fight a sort throat that limited my ability to carry on a conversation. The opening industry session was the best of all that I heard at WOIC. Yes, they focused on healthcare, which has been my main teaching and service focus since changing employers in 2011. It's also that (as my pharma friends told me for years) in the end saving lives is more important than (although not as profitable as) developing game software. However, we were also fortunate to have a great panel of industry experts focusing on healthcare innovation — organized by Solomon Darwin. (I summarize the session on my BioBiz blog). While my industry focus has changed, there are two reasons I think I would have enjoyed it in my earlier life. First, Sanjita Reddy offered a very cogent explanation of why the superior efficacy and efficiency of her father's Madras-based hospital chain was about more than just lower labor costs. Second, chronic tech entrepreneur Pramod John provided a textbook explanation of how structural inefficiencies of pharma distribution are adding friction (i.e. cost) to the system and are ripe for disruption. Systems. What metrics do you use to measure the impact of (Open) innovation post-transfer? How do these align with overall company performance metrics? People & Culture. What are the incentives/motivations for employees to participate in open innovation? What are the cultural challenges during the transfer process and how do you try to overcome them? Lee talked about Parc's new role as a stand-alone subsidiary of its (in)famous parent. Haroon described the $1 million internal innovation contest that was so successful, it ended up awarding four (instead of one) prizes. Varma described how HCL’s top innovators (in the US, India or elsewhere) win a Mercedes, and the cars in the parking lot serve as an ongoing reminder of their success. I was not presenting in the second day, but did attend three academic sessions, moderating one. (I actually was the one who assigned the moderators, and was quite pleased at both the fit and the value these experienced scholars provided). The first session focused on open innovation in SMEs, a major theme in our 2014 book and the work of Vareska van de Vrande. The session was moderated by Sabine Brunswicker — co-author of the 2014 SME chapter — who emphasized the importance of value networks to the success of small and medium enterprises practicing open innovation. The first paper (presented by Chiara De Marco) looked at the strategies of eight Italian SMEs, while the third (presented by Katie Hyslop) examined those of three Austrian SMEs. In between, Freek Meulman examined something completely different: a new process by which an intermediary could identify potential SME suppliers (or collaborators) for inbound OI. 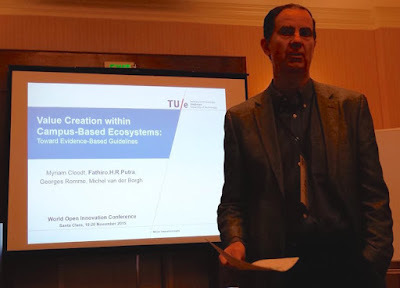 The second session was one that I moderated, on three papers that fit the network level of analysis for open innovation (as defined earlier by our 2006 and 2014 books). Using my chapter from the latter book, I summarized the prior research and encouraged scholars to study this area. (In retrospect, I should have also mentioned the 2006 chapter on local spillovers and open innovation, since two of the papers focused on local clusters). The first paper (presented by Fathiro Putra) examined the tightly localized clustering dynamics of a specific industrial park, High Tech Campus Eindhoven. Instead of a cluster of firms 50 or 100 kilometers across, the authors examined the development of a local cluster of several square kilometers. As we showed in our 2006 chapter, local spillovers and other agglomeration effects are an important element of open innovation. The second paper, by António Santos, examined the efforts by the Portuguese government to establish 16 industry-specific clusters. He came up with an interesting classification to contrast these clusters on two dimensions. One was the degree to which open innovation was considered important by the firms, and the second was the degree to which the cluster positively impacted (open) innovation practices. The final paper, presented by Andy Zynga, sought to explain the timing of when firms build capabilities that aid their open innovation efforts. It used the responses of more than 700 firms to an online survey dubbed the “NineSigma Open Innovation Diagnostic Tool.” (In retrospect, while the data was gathered by an intermediary, the actual study had little to do with how intermediaries manage a network of collaborators). In the final session, John Ettlie moderated three papers on industry-specific studies. Jason Li-Ying explained licensing strategies of Chinese firms. This wwas followed by a study of nanotechnology collaboration presented by Arman Sadreddin and T.J. Hannigan discussing the hybrid joint venture of GM, Daimler and BMW. In this regard, this (and some other sessions) reminded me of trips to the Industry Studies Association, where the focus is on research informed by a deep understanding of industry dynamics. Although there were some overlaps with our 2014 conference, in many ways this was a very different conference. There were less European academics, particularly senior ones -- who may have come last year to visit the Napa wineries. a the same time, our convenient Silicon Valley location brought a lot more industry participants, changing the character of the discussion in a way that was noticed by both the academic and industry attendees. We are waiting to see the surveys before making plans for the 3rd World Open Innovation Conference. We expect it will be in December 2016, but have not picked a location. Ideally, we would have a plan that attracts both strong industry pariticpation and also the depth of academics we had last year. #WOIC2015 — the 2nd World Open Innovation Conference — began today. Although the academic program doesn’t start until 10:30 am Thursday, a lucky few spent the afternoon at Google for a lunch, tour and briefing. (As with the overall WOIC, there was a waiting list for the tour). Tonight we had the opening reception, and then an informal keynote by conference chair Henry Chesbrough before dinner. Because of the available plane flights from the LA region — and teaching commitments — I had to skip the reception and joined the dinner a half hour late. Still, I had a chance to visit with the participants during and after dinner, as well as see the layout for the next two days’ sessions. (A complete program with last minute revisions is now online). It’s quite clear our authors are thrilled to be here. As with 2014, we have a great group of OI scholars. However, what’s new is that we are here at one of (if not the) innovation hubs of the world. We have more than 60 industry attendees, which will certainly change the character and the tone of the discussions. This was always the goal of the first WOIC, but being two hours away in Napa Valley (while a delightful experience) limited the number of industry people who could sneak out for a day. Stay tuned for more updates on WOIC 2015.